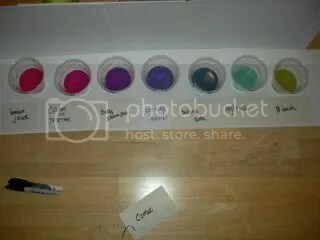 Today’s experiment was making a homemade pH indicator using red cabbage. 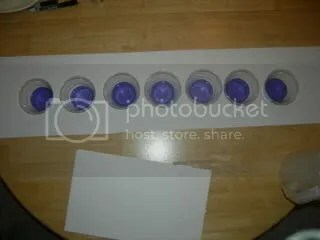 I saw this cabbage chemistry experiment at DIYScience and just had to try it at home. Caution: This experiment requires the use of a knife, poisonous chemicals and hot water. An adult should assist with this experiment. Always follow the safety advice on the products you are using. Do not mix your products together. Only add them to the cabbage water. * Technically we didn’t have Comet, so it’s not included in this experiment. Apparently, comet is the only commonly used household cleanser that is strongly acidic. Do not attempt to substitute for other kitchen cleansers such as Bon Ami – it’s calcium carbonate and it’s basic and it won’t work for an acid. So we followed the directions and cut up about 4-5 cabbage leaves and soaked them in a glass container with hot water and shook it. After a few minutes, the water was turning a nice purple. I left it there to cool, then strained the water from the cabbage. 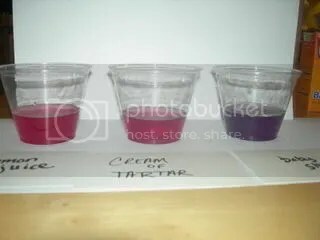 Then we filled the cups about 1/3 of the way with the purple cabbage water. Then one by one, added a tiny bit of each substance (1 substance per cup) and stirred them. To the one in the middle, we didn’t add anything as a control. Here are some closeups of the acids. I was slightly disappointed in the fact that there was only a very subtle difference from the lemon juice and the cream of tartar. It wasn’t like I expected. I was hoping for more of difference. 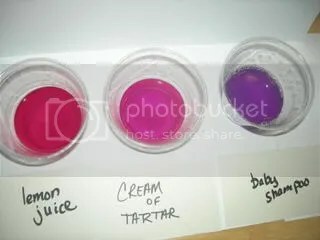 I’m going to have to repeat this experiment using real Comet (accept no subsitutes) and choose another mild acid. Closeup of the bases. The last three cups are – baking soda, mylanta, and dishwasher detergent (yes, I know the card underneath says bleach). We’re also going to have to test a few other substances – like for instance, I was almost going to try to use aspirin (acetylsalicylic acid) as a mild acid and see if I get more of a contrast with the lemon juice. 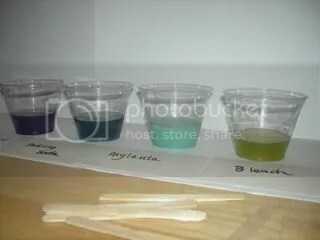 We will be repeating this experiment some day, and also trying to test substances and have my daughters determine whether or not an unknown substance is an acid or a base. Do you have any alternatives to Comet? What if I couldn’t find one where I’m at?